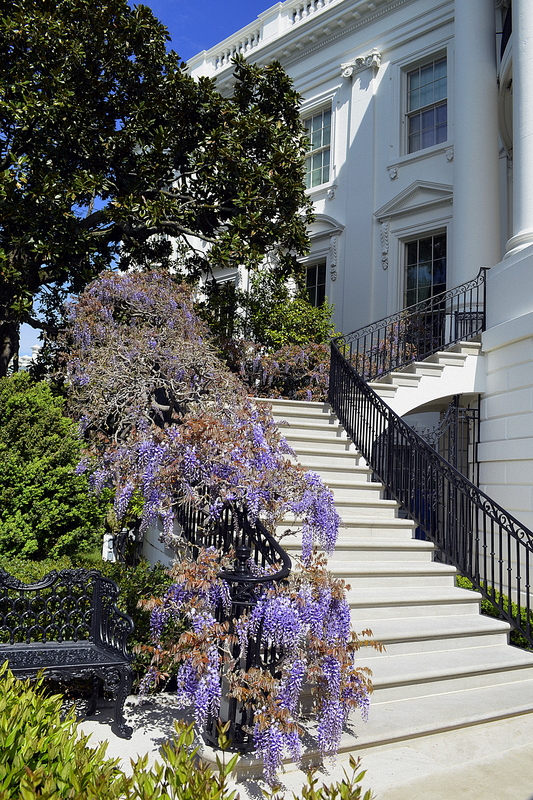 Last weekend, I was lucky enough to go on the White House’s Spring Garden Tour with a good friend. 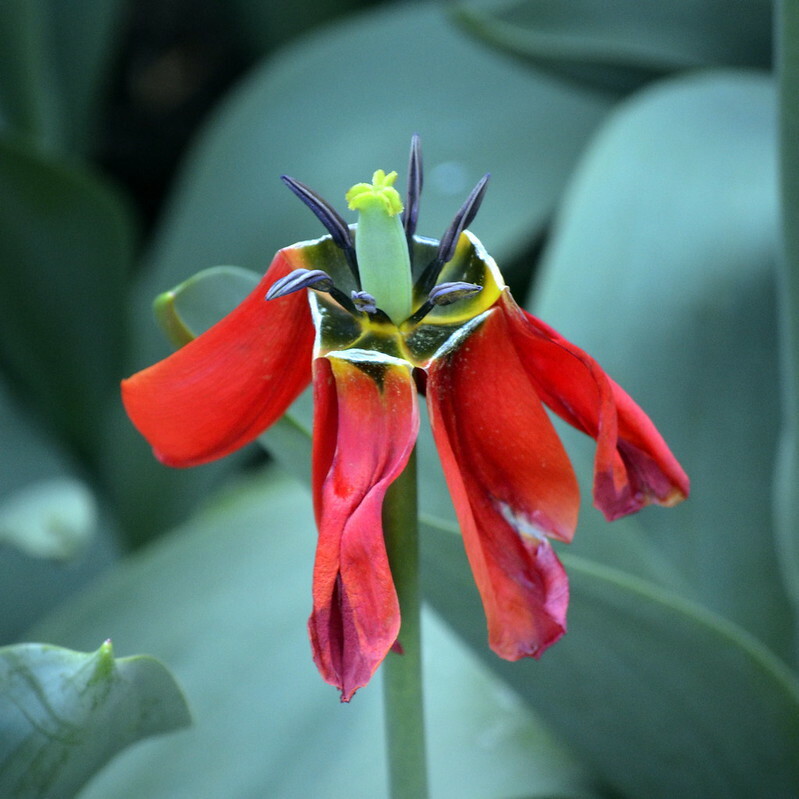 There were tulips everywhere, but these striking red ones caught my eye, probably because they were past the first flush of youth yet managed to look so elegant in their decay. 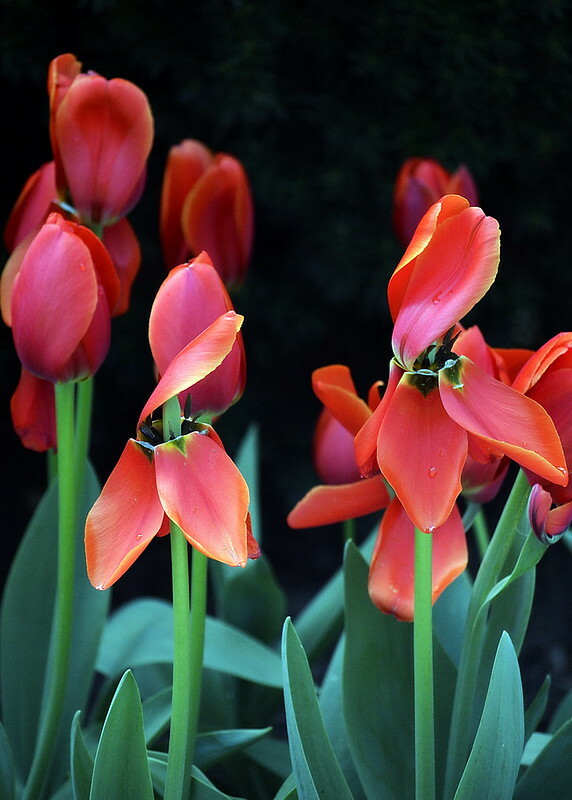 I won’t dwell on the philosophical ramifications of that–but I will dub them ‘Norma Desmond’ tulips since I don’t know what type they actually are. 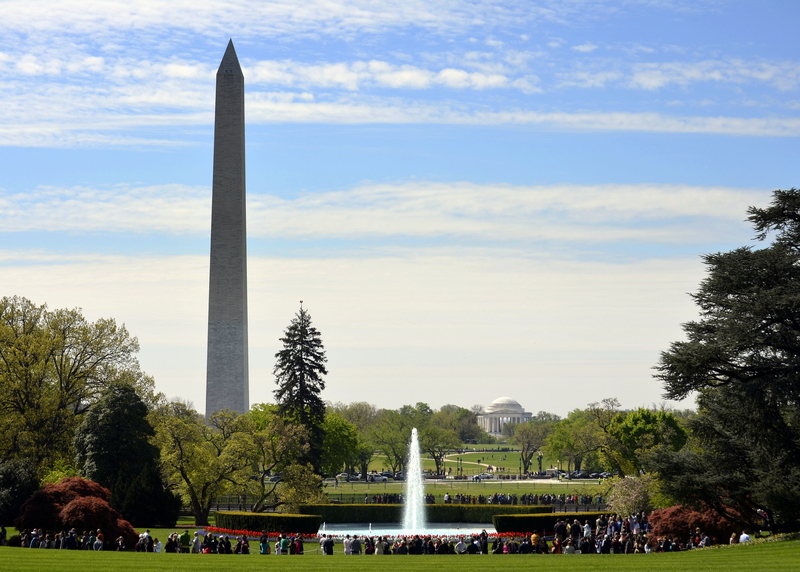 And of course, there is the spectacular view from the White House of the Washington Monument and the Jefferson Memorial. 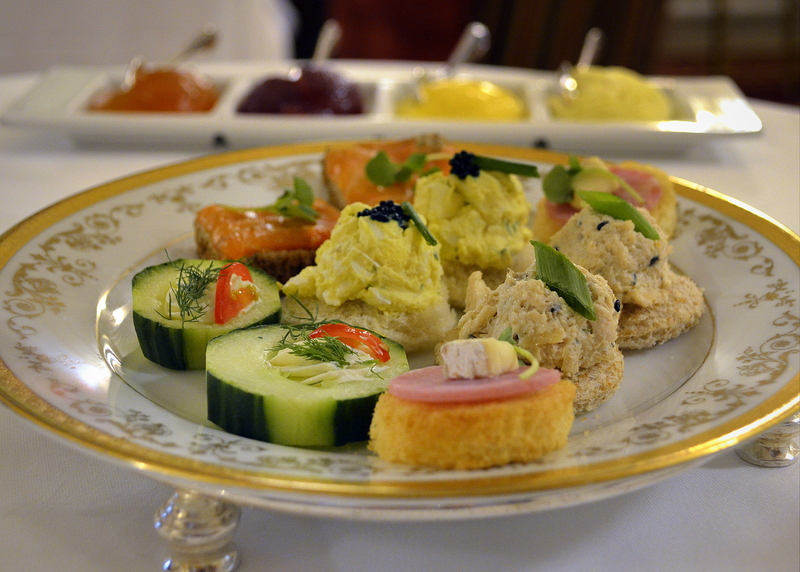 And here is the sandwich part of our tea–a very small part of the overall meal, which also included two kinds of scones, four types of pastries, and chocolate mousse. 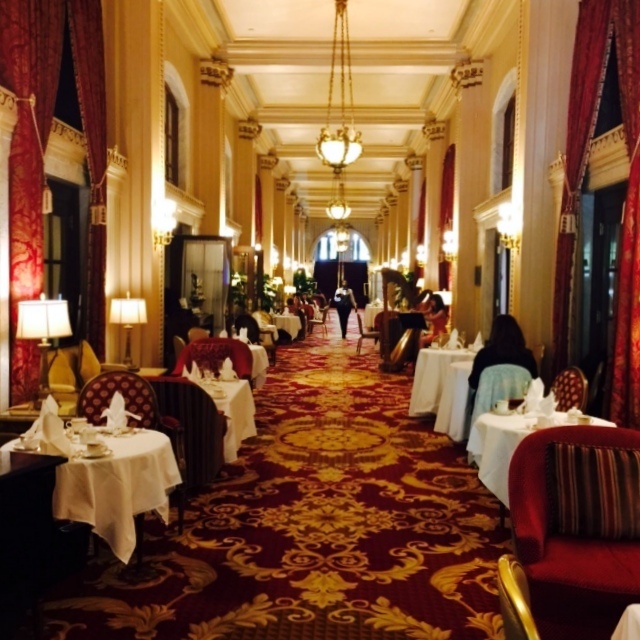 And a pot of tea. Flowers, tea, and friendship. A great day all around. Is it a bird or a banana? 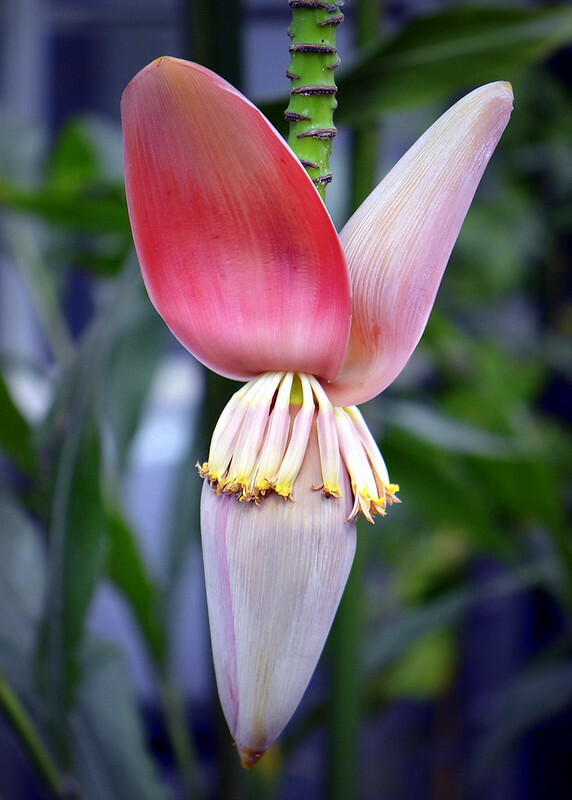 When it comes to Bird of Paradise, False Bird of Paradise, Parrot or Parakeet Flower, Macaw Flower, Crane Flower, Banana, Wild Banana, or Wild Plantain–it can be hard to tell which is which. 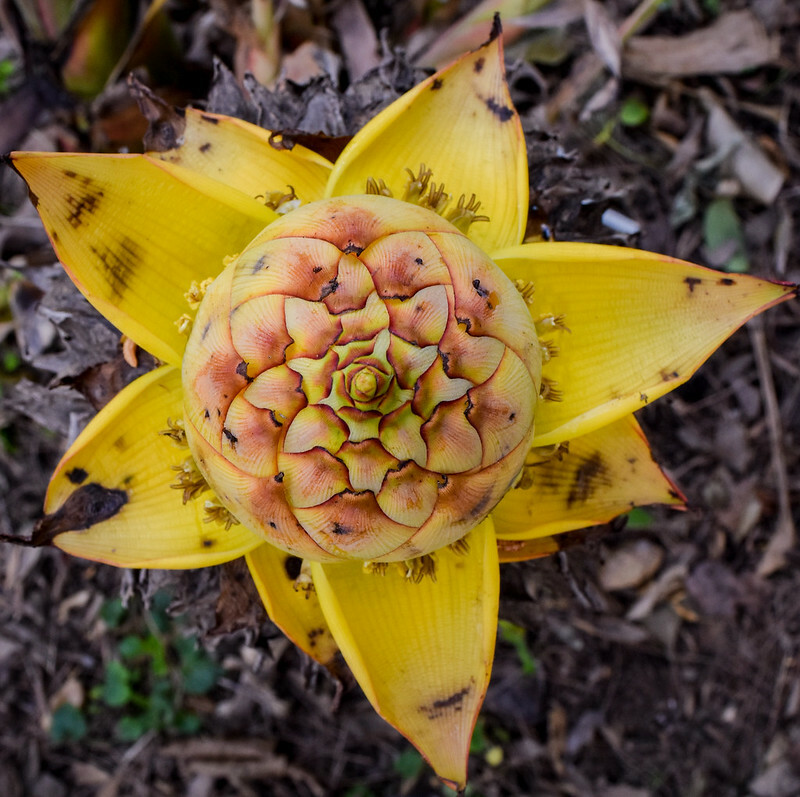 That’s because these tropical plants belong to three closely related families: Strelitiziaceae, Musaceae, and Heliconiaceae. 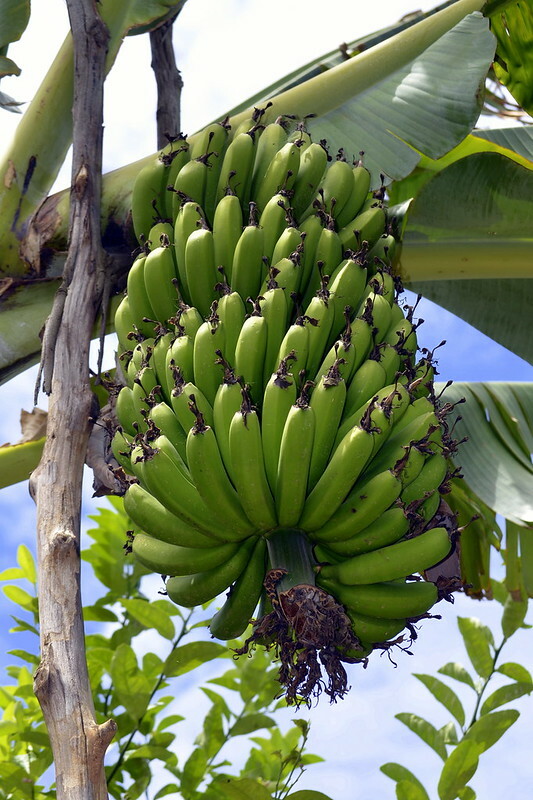 And yes, some look like birds, others look like banana plants, and some actually are banana plants. 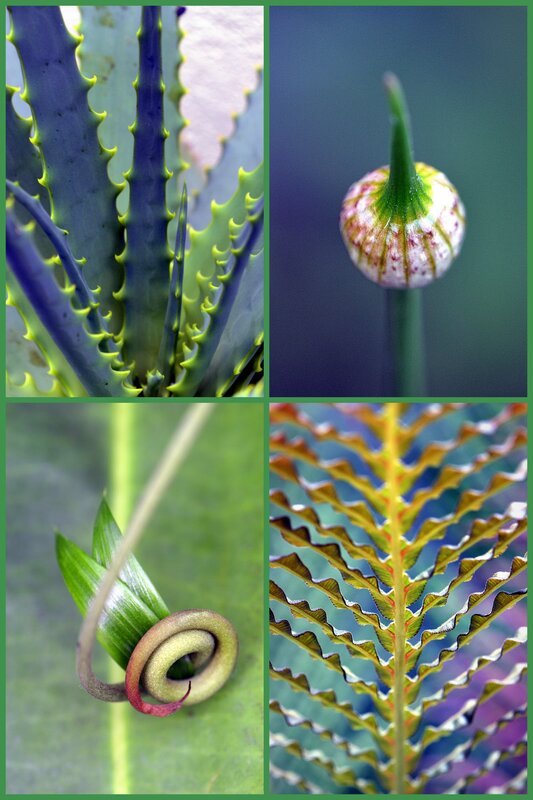 Though common plant names can be endearingly whimsical and creative, they often lead to confusion; many plants have multiple common names and the same common name can refer to more than one plant. 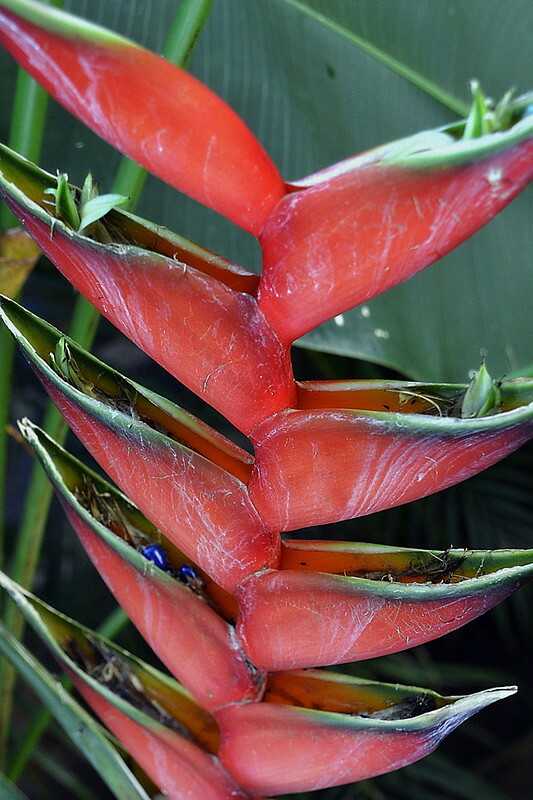 Today, thanks to binomial nomenclature (and to Google and other easily accessible sources), it is fairly easy to figure out that one person’s Bird of Paradise is someone else’s Crane Flower, and that both, in fact, are the same Strelitizia reginae. But back to plants that look like birds. In 1773, Sir Joseph Banks (then director of Kew Gardens) took advantage of the system of binomial nomenclature to give the exotic Bird of Paradise plant–with its orange sepals, purple petals, and beak-like spathe–its scientific name (Strelitzia reginae) in honor of Queen Charlotte of Mecklenburg-Strelitz. Queen Charlotte was the wife of King George III of England, an enthusiastic amateur botanist, and a strong supporter of Kew Gardens. 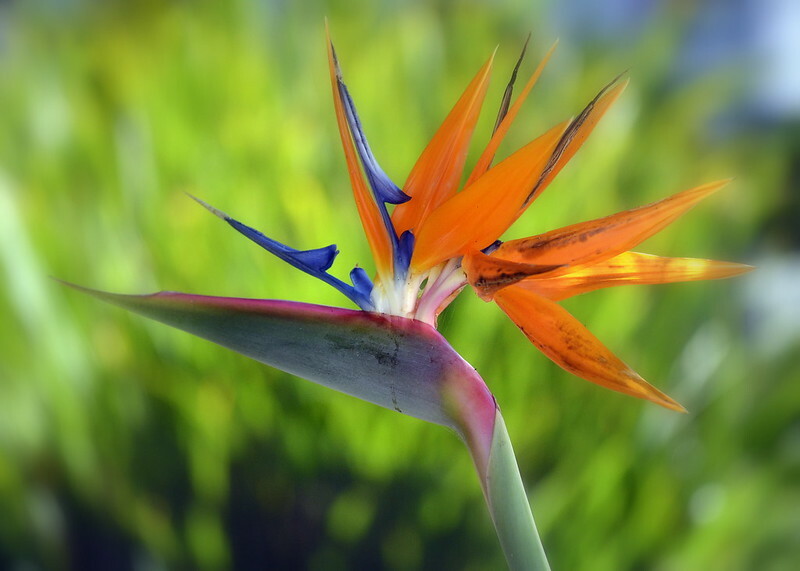 The genus name Strelitzia refers to the Queen’s birthplace; the species name reginae comes from the Latin for “queen.” Strelitzia nicolai, on the other hand, refers to the Wild Banana, aka the Giant White Bird of Paradise. It received its species name in the 1800s, when two German-Russian botanists named the plant nicolai in honor of the Grand Duke Nikolai Nikolaievich, son of Czar Nicholas I of Russia. Birds or bananas–those are lofty names indeed. I’m just glad I now know which is which. 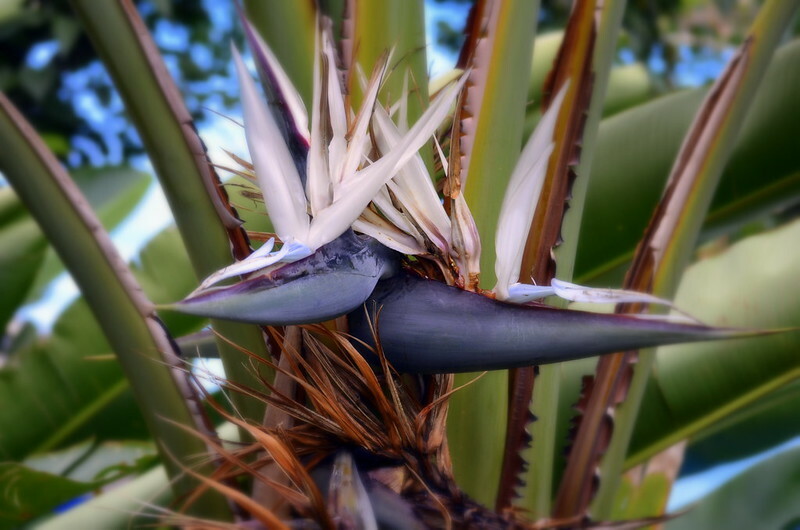 Strelitzia nicolai (Giant White Bird of Paradise) aka Wild Banana–though it does not produce edible fruit. 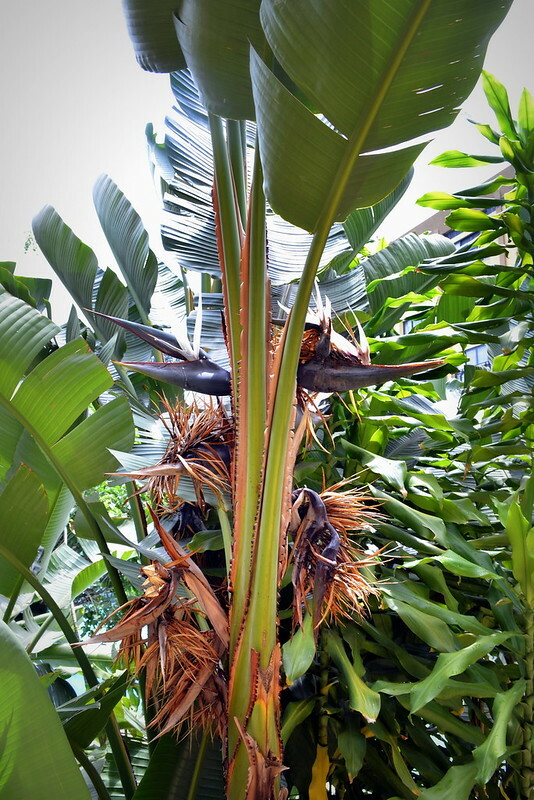 Strelitzia nicolai, left; an edible banana plant in the Musaceae family, right. 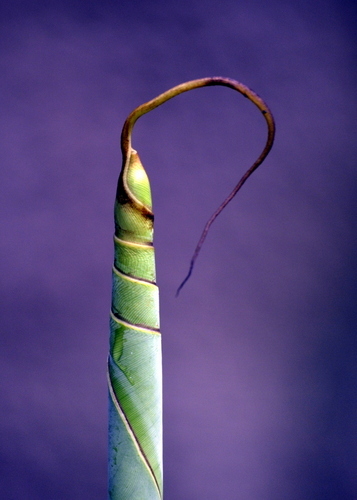 They look very similar when not in flower–see the leaves. Heliconia psittacorum (Parakeet or Parrot Heliconia), left; Heliconia bihai (Macaw Flower), right. 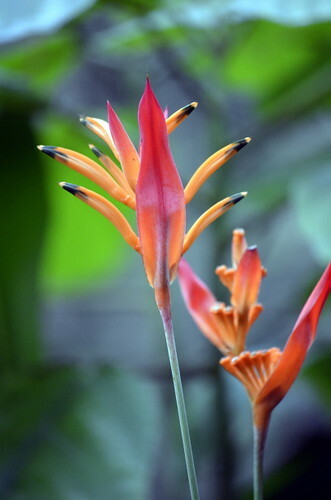 Heliconia are also known as False Bird of Paradise and Wild Plantains because their leaves are similar to the leaves of the Bird of Paradise and banana plants. Sometimes, blown car tires lead to unexpected opportunities. While in California on our way to Monterey, our tire blew out on the freeway and very spectacularly separated itself from the rim. Our oldest son was driving and successfully steered the car to the side of the road, with the help of a kind truck driver, who stopped traffic in the right lane to let us over. 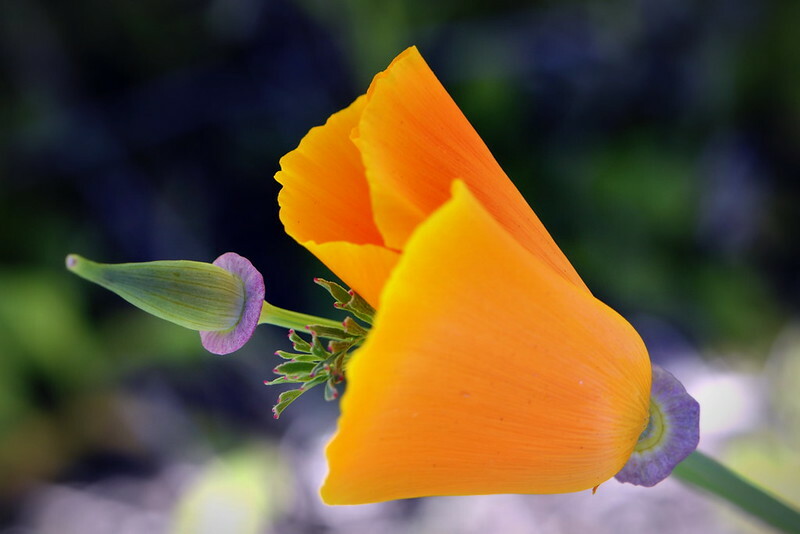 While the spare tire was being put on, I noticed a cheery patch of poppies down a small hill, and headed there with my camera, whereupon I had an impromptu lesson in reproduction–of the floral kind. 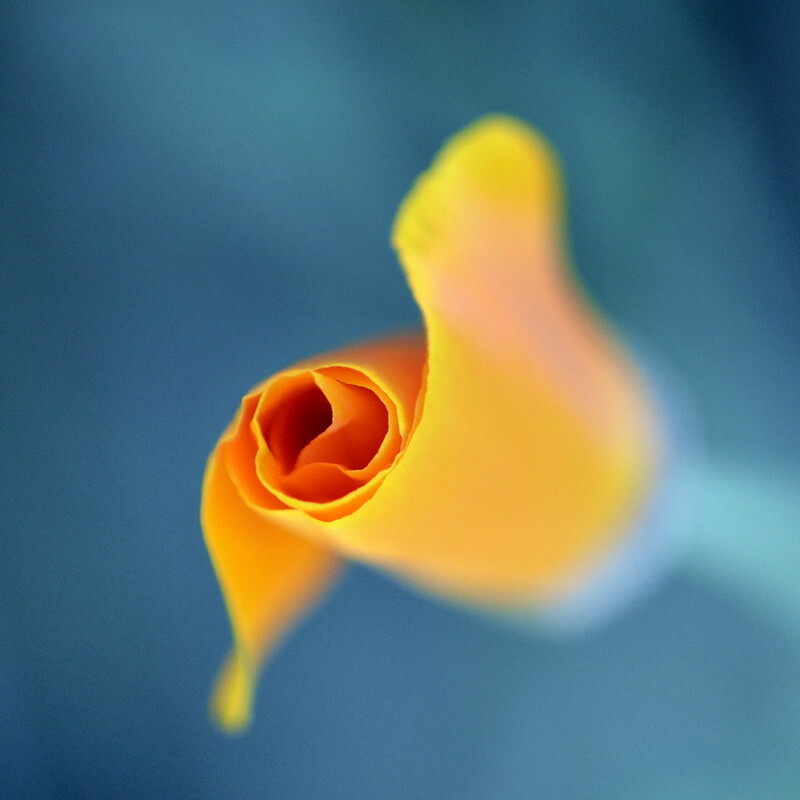 The Golden State loves golden symbols, so it’s no surprise the California Poppy is the state flower. 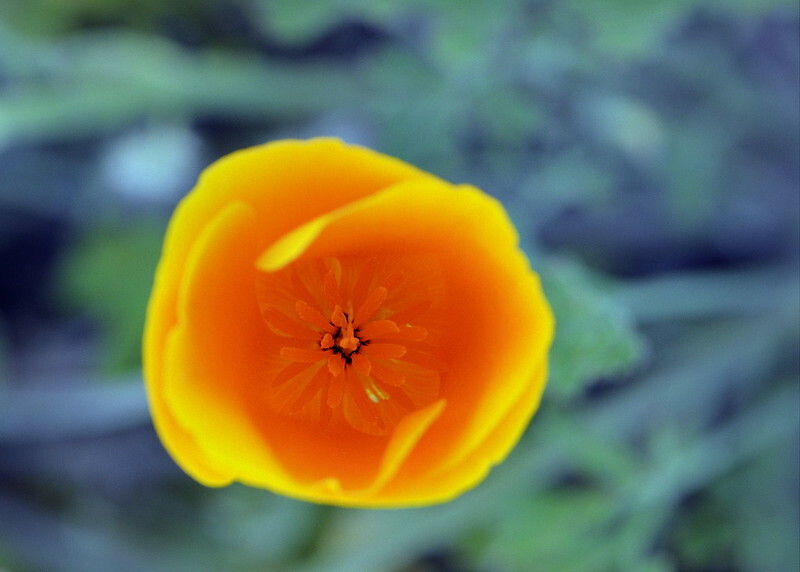 It’s a favorite of many gardeners, but also grows wild across California and elsewhere; masses of poppies make some Western mountains look as if they have been dusted with orange-yellow confetti. They also grow by the roadside, where I was lucky enough to get to study them for a little while. In that scraggly patch, there were poppies at all stages of development, from buds to full flowers, to seed pods. 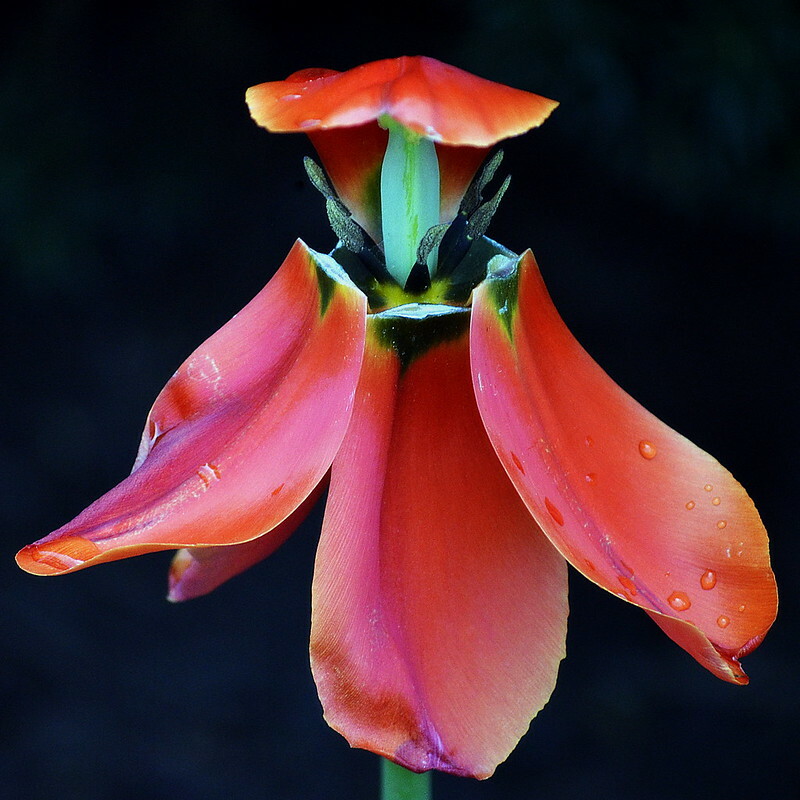 The flower buds are encased in a calyx made up of two fused sepals; the papery cap slowly gets pushed off as the four overlapping poppy petals begin to unfurl. 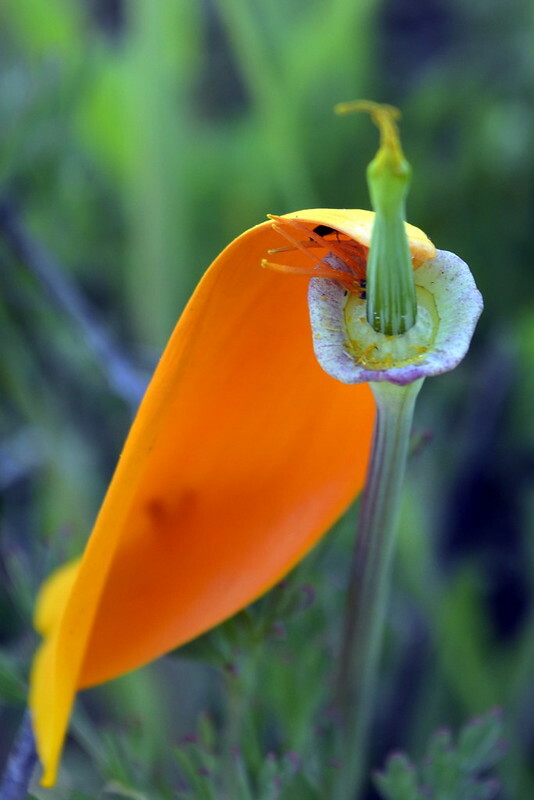 Inside the cup-shaped flower itself are the stamens (pollen-tipped male reproductive organs) and the pistil (female organ), waiting for pollinators–usually bees, but also beetles and flies–to help ensure a new generation of Eschscholzia californica. This is the plant’s very civilized (and somewhat passive) Plan A in terms of reproduction. But, there’s a Plan B, too–and it’s a bit more lively. 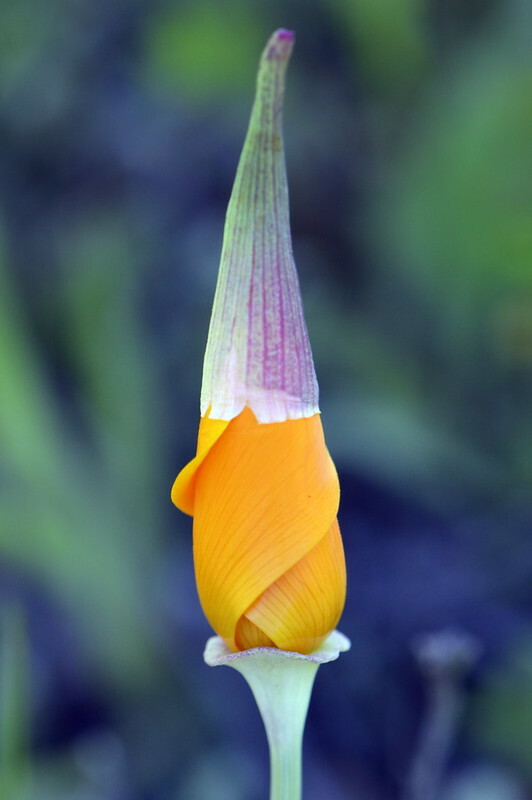 Once the poppy’s main flowering cycle comes to an end, the petals start dropping off, revealing an elongated seed pod (fruit) sitting on the disk-like torus. The pod gets longer and bigger, starts drying up in the sun, and finally bursts open, ejecting seeds as far as 6 feet away. This type of seed dispersal has a great name: explosive dehiscence. Oh, how I wish I could have seen it in action. So, what pollinators cannot achieve, the plant takes care of on its own, spreading its wealth just a bit further one seed pod at a time. 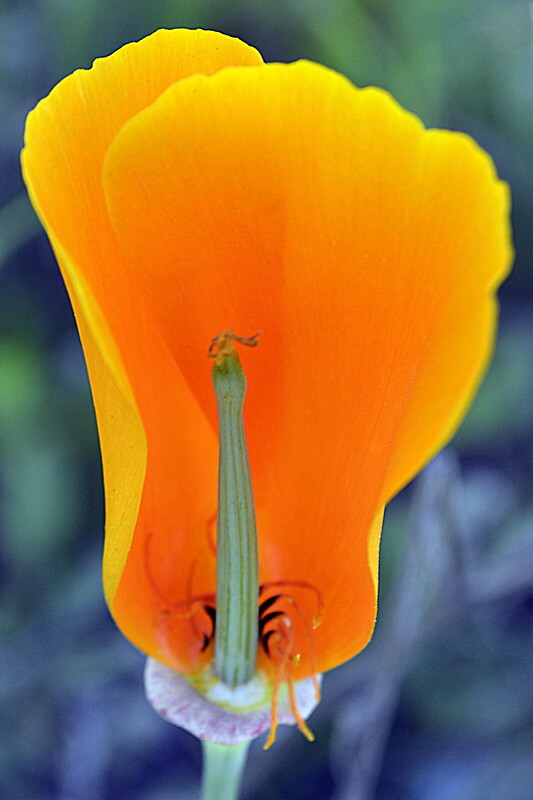 Something to admire this April 6, which is California Poppy day. Chestnuts–which are chewier and starchier than, say, walnuts–have been a staple food in southern Europe and parts of Asia for millennia. 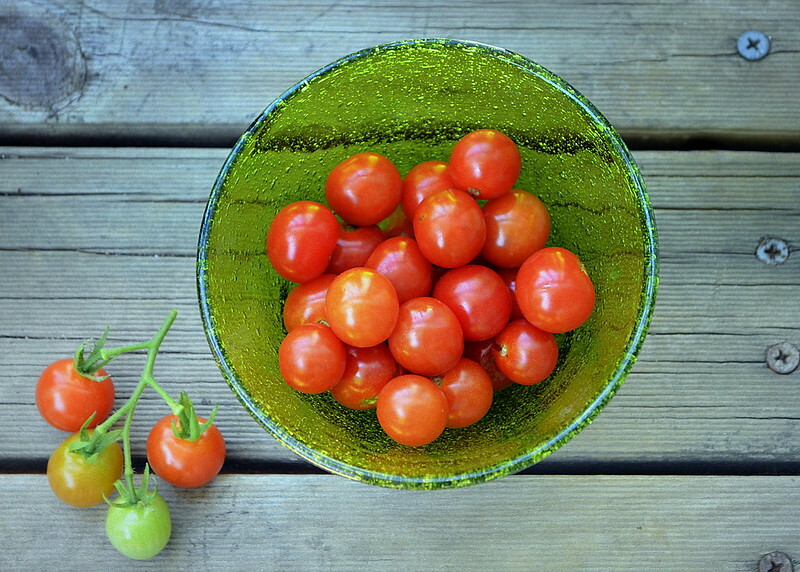 They can be boiled, candied, eaten raw, mashed, roasted, sautéed, steamed, or ground into flour–and have long been a favored ingredient in stuffing, vegetables dishes, casseroles, porridge, and desserts. 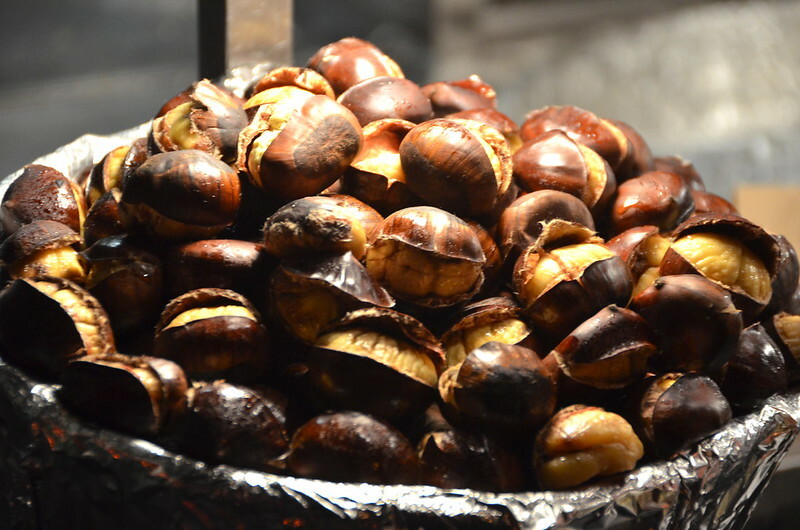 They have less calories than other nuts and are the only nut to contain significant amounts of Vitamin C. So, as often happens when nutritious traditional foods are “rediscovered,” chestnuts and the naturally gluten-free chestnut flour are making a comeback, especially in upscale U.S. restaurants and specialty stores. Demand for chestnuts in the United States outstrips supply. There are four main species of chestnuts: European, Chinese, Japanese, and American. The American chestnut (Castanea dentata)–known as the sequoia of the east because of its height–was almost completely wiped out by blight in the first half of the twentieth century, right around the time my father was enjoying the roasted (and probably Italian) versions near his school in New York City. Four billion trees died. 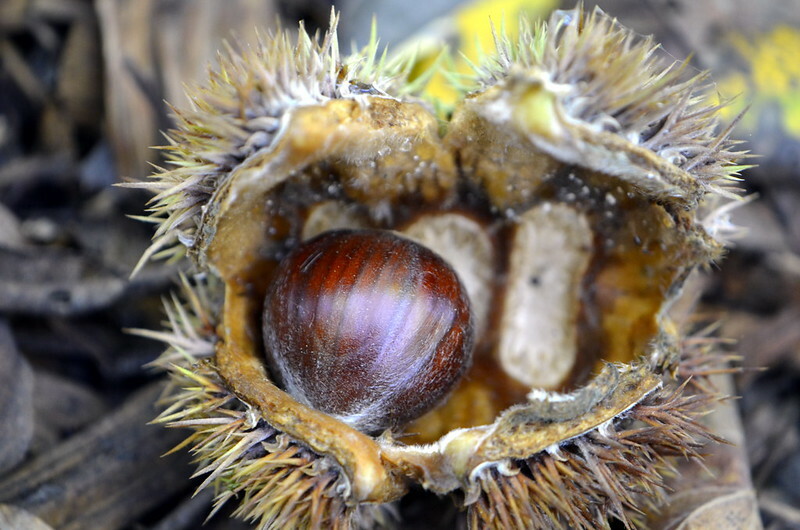 Before tragedy struck, American chestnut trees were highly valued not just for their nuts, which fed both people and animals, but also for their wood. Nowadays, most of the chestnuts we eat in the United States are imported, but efforts are underway by organizations such as the American Chestnut Foundation and others to breed blight-resistant American chestnuts and reintroduce them into the forests of the American east. 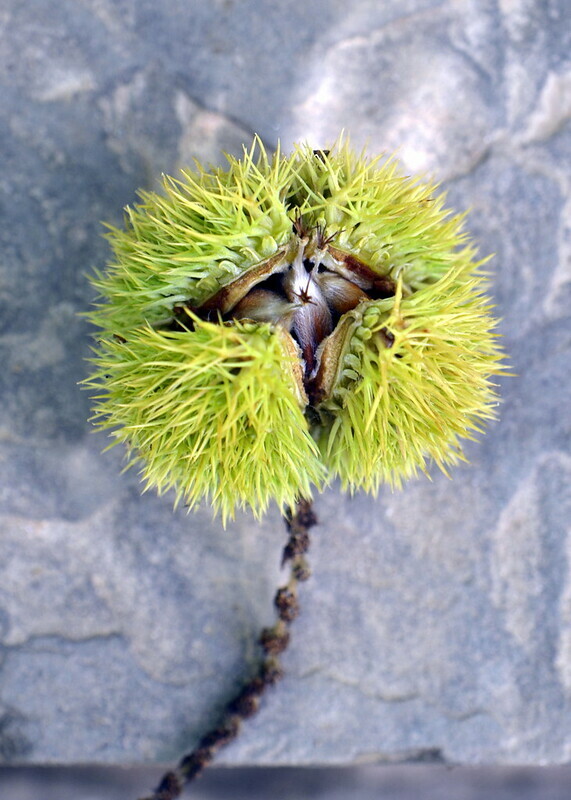 In the meantime, the most commonly seen chestnut trees in the United States are Chinese Chestnut trees (Castanaea mollisisma), which are resistant to blight. On a recent visit to the Audubon Naturalist Society’s Woodend Nature Sanctuary, Castanea mollisima burs carpeted the ground. Here are two burs (and boy, are they prickly and sharp), one of which is beginning to open. 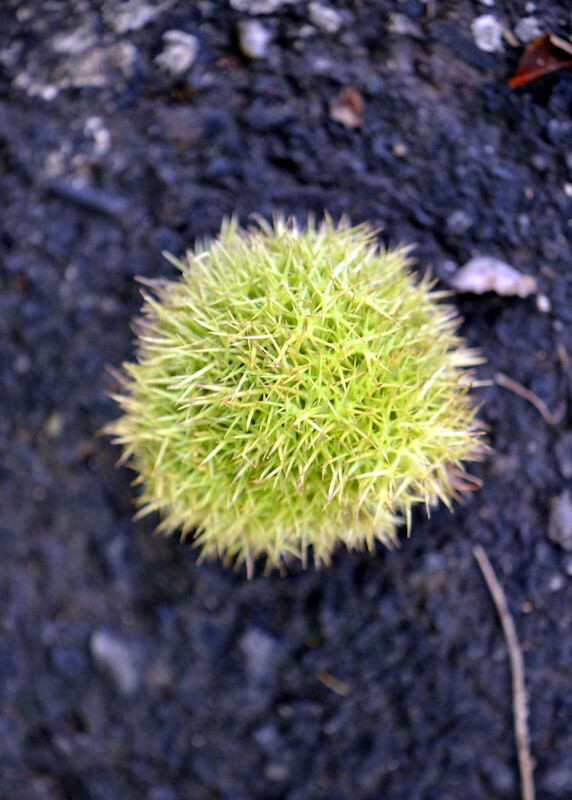 Chestnuts are harvested once the burs have fallen from the tree. Typically, there are up to three nuts inside each bur; here is a photo with one nut inside a more mature (and browner) bur. The nuts are covered by two “skins”: a dark brown, hard seed coat (or husk) and a papery under layer. 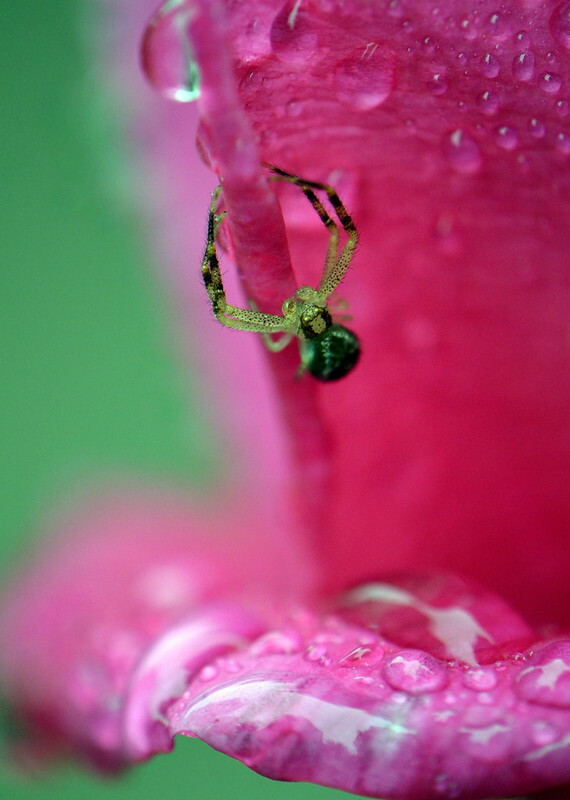 This is the story of a small spider in my garden. 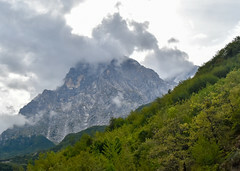 It being a cloudy and rainy morning, I grabbed my camera and headed for the yard. 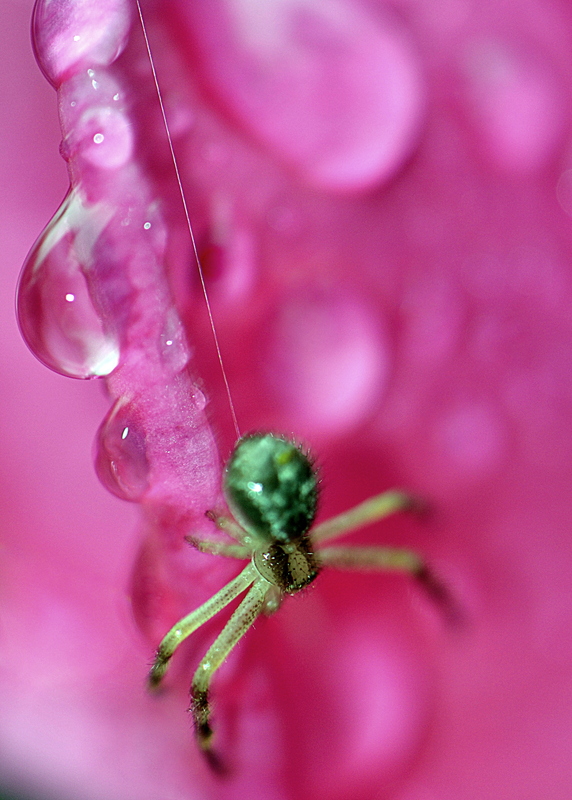 When it’s wet outside, colors pop and raindrops pearl on flowers and foliage—a gorgeous sight. But I only got as far as the sole remaining bloom on a Hybrid Tea Rose “Perfume Delight,” because I discovered that a small but industrious spider had established a new home there. 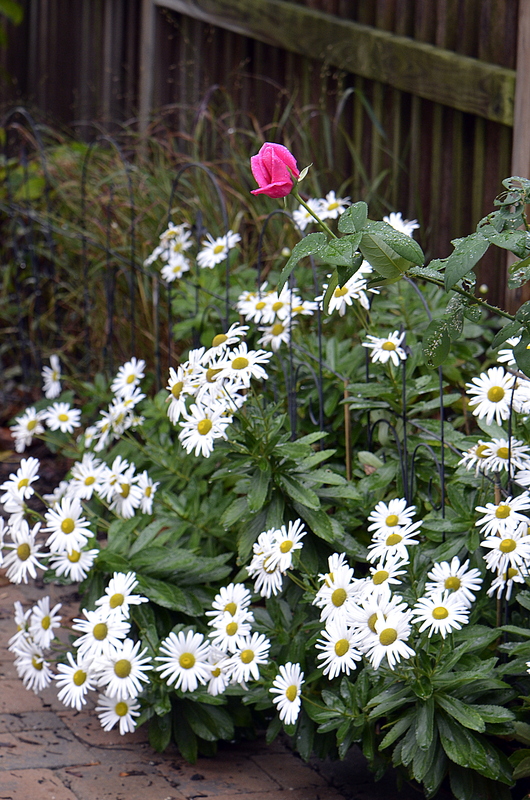 For perspective, see the lone bloom below (amid some Montauk Daisies), and a close-up of the spider on it. 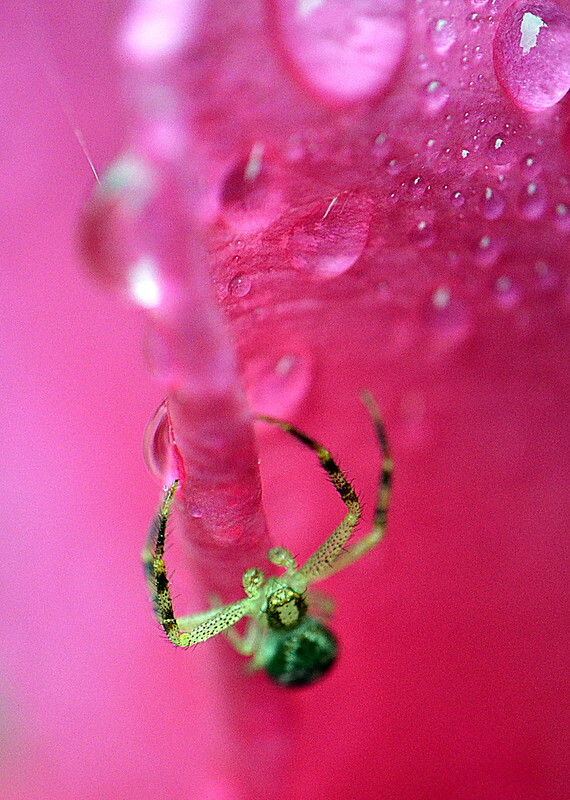 It’s hard to see, but for a good part of the morning, that spider was busy making silk threads; the first photo below shows a thread at top left, and the other is a not-very good photo of the spider spinning (I managed to focus on the thread and a few rain drops, but alas, not on the spider…). That rose bloom wasn’t there a couple weeks ago. The spider could only have happened upon it recently, not knowing it had chosen an ever-evolving and ultimately doomed home. 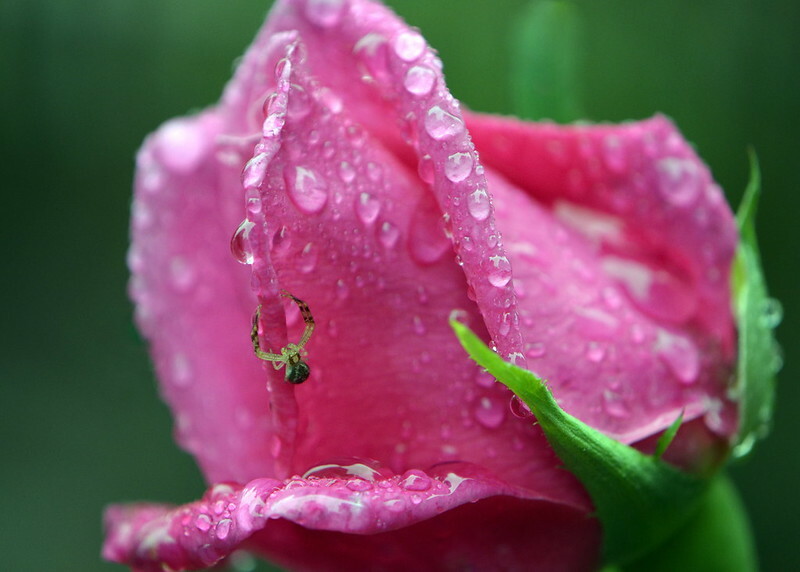 Even in the few hours between this morning and this afternoon, the rose bloom unfurled a bit more, breaking some of the spider’s newly spun threads. In a couple weeks, the bloom won’t be there at all. 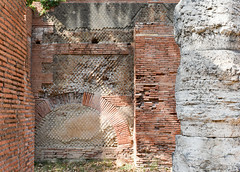 And yet, the spider remains, a Don Quixote in disguise. 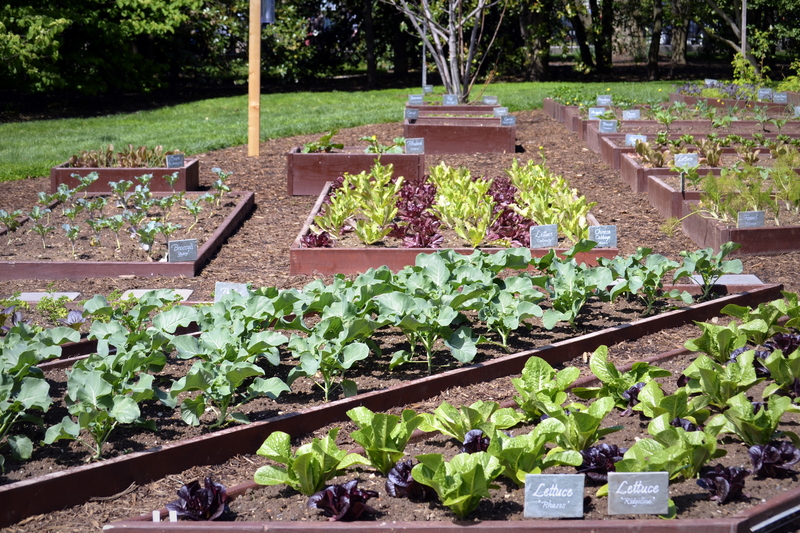 Plants are wily, in their own ways. Some beguile with sweetness, others lure with deceit. This weekend at the United States Botanic Garden, I saw examples of both. 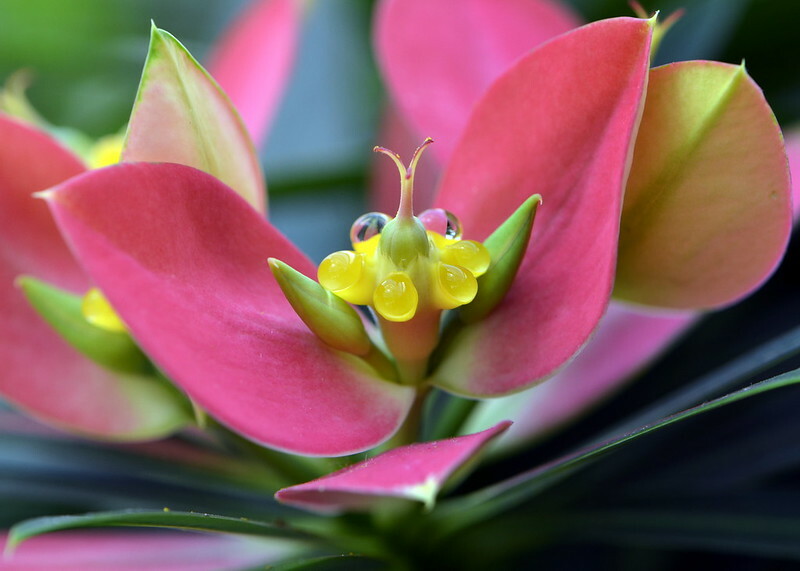 The Jamaican Poinsettia (Euphorbia punicea) takes the nicer approach. Below, you can see the brightly colored bracts, which are modified leaves, and a yellow, cup-like flower cluster called a cyathium. 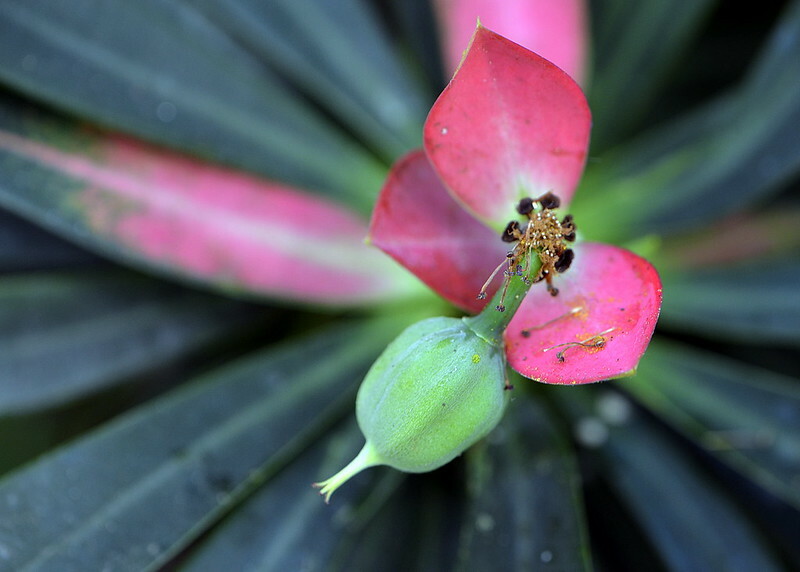 Insects are attracted to the clusters by the reddish-pink bracts and are then rewarded with the sugary nectar; in the photo, the glistening drops are almost overflowing from the cups. 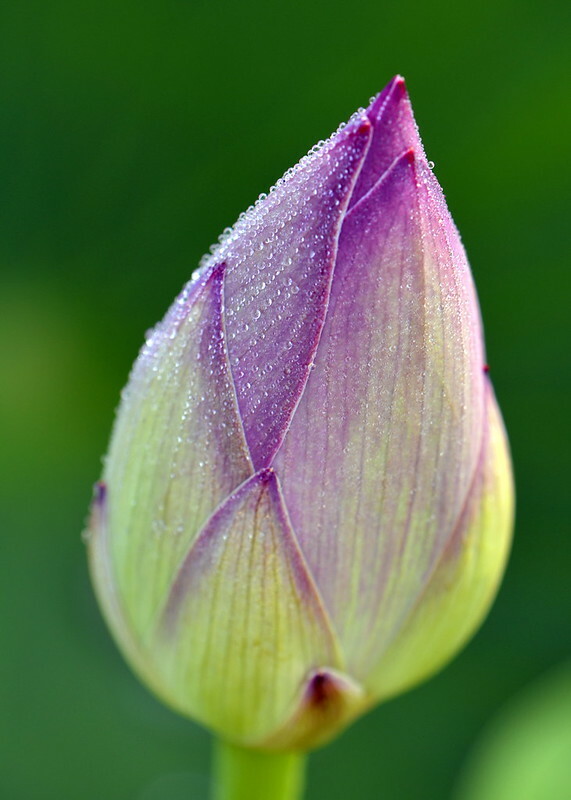 Arising from the center of the cluster is the pistil (the female reproductive organ), with three curved stigmas at the top, waiting to receive a dusting of pollen from the visiting pollinator. 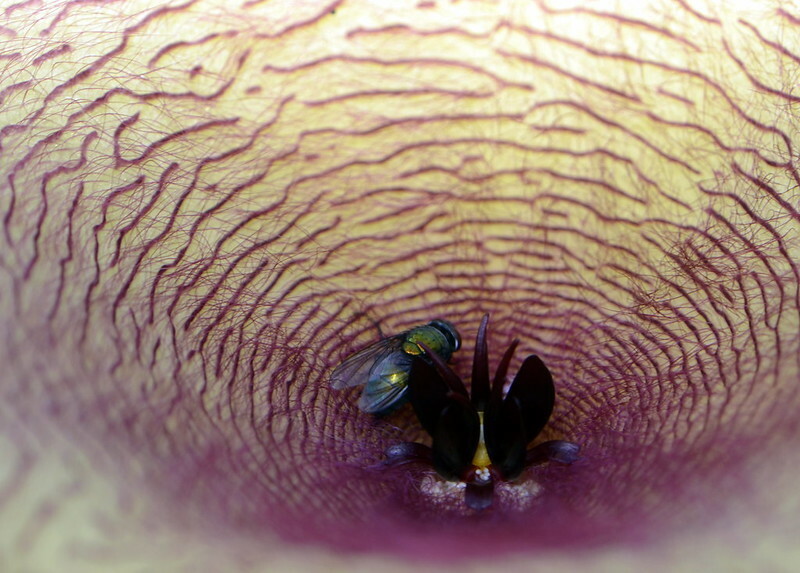 Successful pollination leads to the development of a seed-bearing fruit. 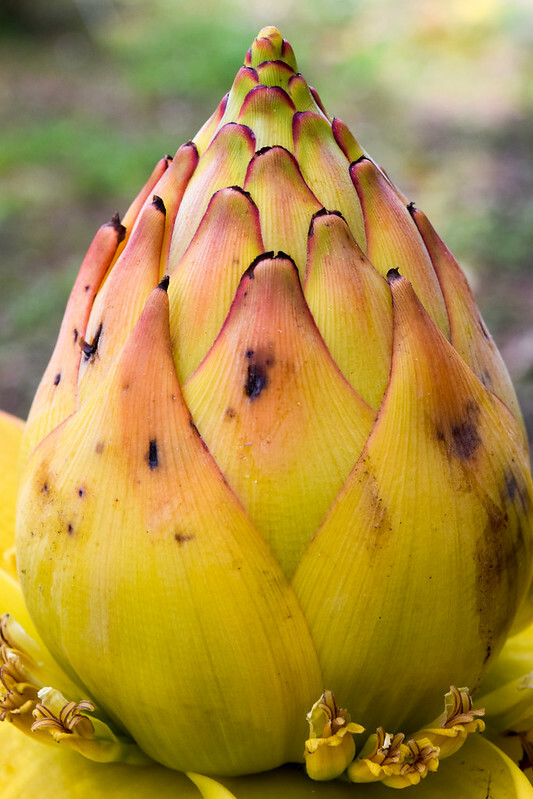 But if the plant has not been successfully pollinated, the fruit may wilt and never produce seeds. 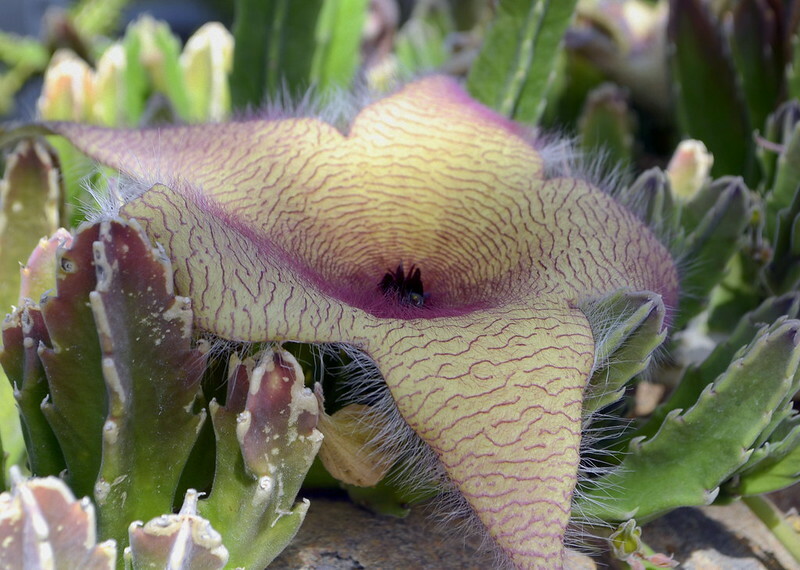 Other plants, such as the Carrion Flower (Stapelia gigantea), attract pollinators by pretending to be (and smell like) something they are not: rotting flesh. 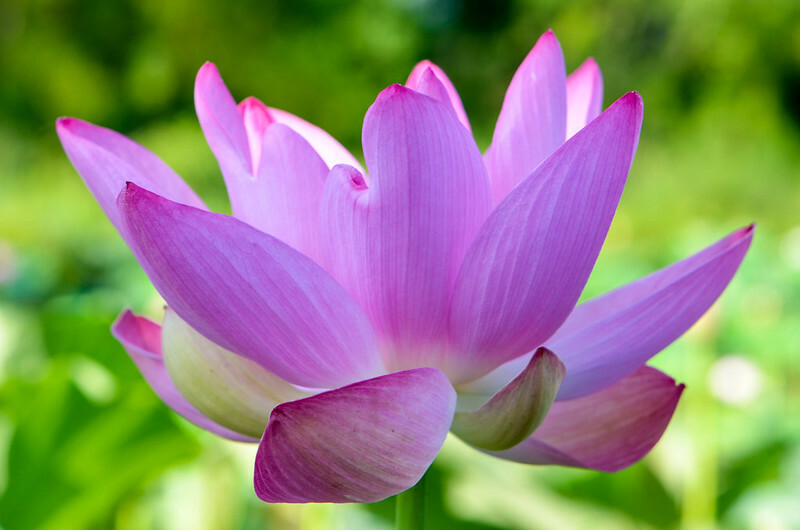 You might think that if someone knows a flower smells like a decomposing mammal, s/he would avoid taking a sniff. But no. I partook of the putrid odor more than once, and can confirm that the flower does indeed smell vile. I pointed this out to other passersby, who also conducted repeated olfactory experiments of their own with identical results…. But back to the plant. In addition to its odor, this wrinkly and hairy flower is also meant to look like a decaying, oozing, leathery, peeling dead animal. And boy, do some insects love that. Perfect spot to lay eggs, with plenty of food for the larvae, or so they think. They are mistaken; their reproductive efforts are futile. But they will have served their purpose: to help ensure the reproduction of the plant by taking and depositing pollen as they go about their business. A devious deception indeed. Here is a close up of the inside of the flower, complete with a green bottle fly circling around, and a pile of ill-fated eggs below. 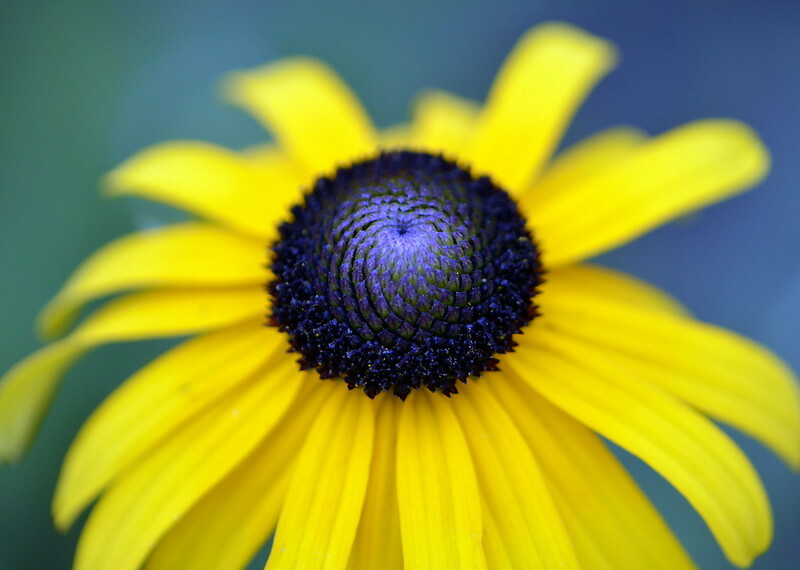 Not far from a mailbox near our house is a cheery patch of yellow flowers commonly known as Black-Eyed Susans. 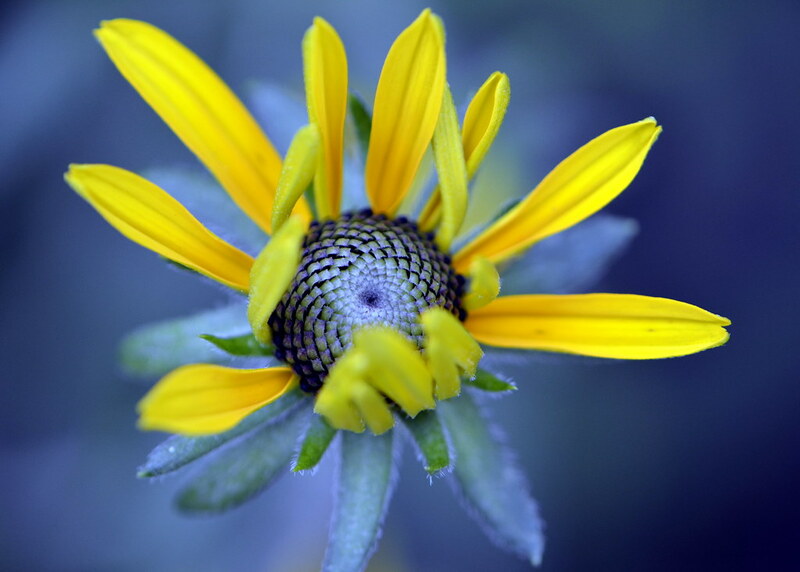 When I went to confirm their scientific name (Rudbeckia hirta), I discovered that–much to my chagrin–they are the state flower of Maryland, which has been our home for the past 12 years. I have no excuse. I really had no idea, despite having some Black-Eyed Susans in the garden of our old house (also in Maryland). My current garden does feature a close cousin: some tall and graceful Rudbeckia maximas. I’m hoping I get some bonus points for that family connection….